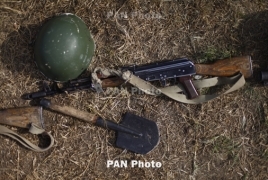 PanARMENIAN.Net - Prime Minister Nikol Pashinyan has said at the 12th congress of the Yerkrapah (Defenders of Land) Union of Volunteers that Armenia will respond to Azerbaijan's threats of war with peace, or peace enforcement, if necessary. “We are ready to work for peace. Therefore, we propose a formula that is acceptable to the international community, which means that any solution to the conflict, any settlement option should be acceptable for the peoples of Armenia, Karabakh and Azerbaijan,” Pashinyan said. According to him, no resolution is possible until such a solution is found, Panorama.am reports. The Prime Minister maintained that the establishment of peace and security in the region cannot be the task of one or two of the three parties to the Karabakh conflict. Meanwhile, Armenian Defense Minister David Tonoyan said at Yerablur military pantheon that the Azerbaijani authorities should prepare their army for peace. Tonoyan's comments came in response to Azerbaijan's recent bellicose rhetoric. Tonoyan had earlier declared in New York that the territories-for-peace formula will no longer exist, reformulating it as ‘new war – new territories.’ He also said Armenia was aiming to boost its offensive capabilities.